During the 7th edition of Five Flavours Film Festival as part of the section Focus: Hong Kong, and later also on VOD platform Kinoplex, the audience had the opportunity to get acquainted with the work of the youngest generation of filmmakers from this city-state. And all this thanks to the project Fresh Wave, that has been launched in 2005. The program of the festival included ten short films focused mainly on two themes: space/city and man. In all presented films these aspects were closely related, however on each of them there's an imposed net of diverse phenomena or problems, which trouble and affect authors of the films. In "Epilepsy" (2011) the director Lee Kai-ho, through an example of a lonely boy, wonders about the callousness and the automation of school, which in his movie acquire all the characteristics typical of penal establishments. Pupils are functioning within the system of obligations and penalties, constantly enforced and in case of non-performance carried out with full harshness. Epilepsy from a title is only one of manifestations (least harmful) appearing among pupils, while continuous screams of teachers fill up quiet and empty corridors. The sense of alienation and exclusion within the surrounding space is added by static frames imbued with darkness and cool blue tones. Even rarely applied praise, end up with admonitions about the need of constant improvement and exerting constant pressure. That pressure leads the students to the behaviour seen in the scenes in the courtyard of the school, which constitute composition brackets of Lee's film. How much charm can have new a re-telling of well-known stories, is convincingly demonstrated in "The Little One" (2012) by Tam Wai-ching. He – since childhood sentenced to live in fear, in between constantly quarrelling parents. When one day the mother takes her own life, the boy stays alone with an impetuous father. She – brought up without a father, her mother have just met a man with whom she would like to be. They – became a foster-siblings, but after some time start to desire themselves. To make matters worse, they are not the only ones who begin to feel it. Despite the lack of originality in terms of narrative, the director achieves his goals, that is both to skillfully present the problem as well as tell about it smoothly. It is managed thanks to the formal layer, due to which the story becomes important again and the viewer can appreciate it once more. Applying non-standard shots and, in places, black-and-white sequences does not play a role of embellishments, it is thought over and appropriately subdued. Apart from well-known motives, Tam adds an interesting fictional feature, which makes the picture more un-obvious. Focusing on the formal side and neglecting the fictional part happens also in the film titled "On Sleepless Roads, the Sleepless Goes" (2012, dir. Isabella Candice Lam). The plot revolves around a lorry driver, who one night witness the theft. He decides to catch a thief on his own, but doesn't succeed. When he goes to the police station, he's met with hostility of the police officer, reprimanding him for the arbitrary attempt to capture the criminal. And this is just the beginning of an extremely unfortunate events. The attempt to portray moral dilemmas of the residents of Asian metropolis is deserving a praise, one should however regret that it's not entirely successful. Flimsy story becomes an excuse push moral message, in its essence quite naive. Shame all the greater because the confusion and some detuning of the internal compass of conduct of the driver were presented with a remarkable audiovisual setting. The director shows a beautifully photographed areas of the city spiced up with an outstanding music, therefore "On Sleepless Roads, the Sleepless Goes" can gain some favours among the audience. Every day a lonely man puts the small portable display case on to his shoulder, takes a folded chair and sets off to work. Every day he stands on the footbridge, where he tries to sell sweet pancakes to passers-by. He struggles with unfavourable weather (climate change causes extremely high temperatures) and constant police patrols, looking for traders without permission. But somewhere beyond all that, a different and much more difficult fight is taking place. The main character, placed in the centre of an unsympathetic space, tries to rescue increasingly blurred memories. This is, briefly, the plot of the film "Still on the Bridge" (2011) directed by Leung Pak-ho. Initially, the idea of this film seems reminiscent of the fragment from Taiwanese "Candy Rain" (2008, dir. Chen Hung-i), in which one of the teenage heroines is visiting a sweet shop. Its owner sells sweets for several decades and recalls old times, while simultaneously making a remarks to the present lack of interest, and hence also customers. In "Still on the Bridge" Leung efficiently captures the fast pace of changes that affect all residents of Hong Kong. He managed to convey anxiety and a specific kind of fear of extremely rapid process of leaving behind an old values and accepting, still unformed, new principles of life. Attempts to preserve memories and memory of the closest people make this film an important, hopefully widely heard, voice. Indian boy named Bilal is the main character of the film titled "The Key Chain" (2010) by Chan Wai-man. When father of the boy is losing a key, his son apart from finding the lost item, is trying to make the title circle, however he is lacking right materials. When paper fails, Bilal setts off to city streets in search of the metal. During short journey he encounters a gallery of diverse characters and, perhaps, learns something. Was Chan trying to say something about intergenerational understanding, being a natural basis for the functioning of every society? Rather no, since the truth about providing mutual assistance is obvious even to a little boy like Bilal (even in adverse conditions, to which one is exposed in quickly developing, Asian countries). Or perhaps the director wanted to present a story similar to those made by Iranian artists? Certainly not, he would need to acknowledge that the level of implementation is too low and work on it a little bit more. What then is the key to this film? Although I have a metal circle, my key is lost somewhere, probably for good. 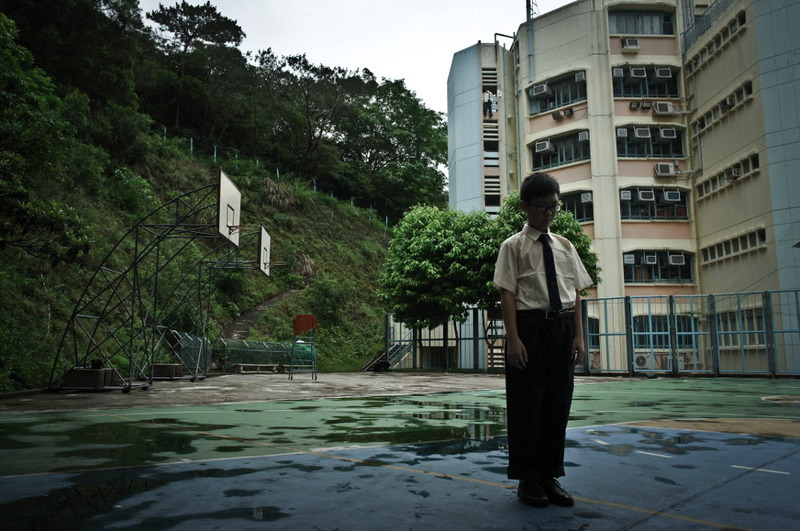 Lau Wing-tai in his short film titled "God Bless All Parents" (2012) raises a problem concerning not only Hong Kong, but also a few other Asian countries, namely exerting omnipresent pressure of educating children from the first days of their lives. The concept is very simple and equally effective. Young parents, along with their several month old daughter, go shopping. They are sitting at one of the stalls, which offers help to learn English for children. The seller is trying to persuade them to get one of the sets for their daughter, that will help her to catch up with already considerable, arrears. Due to the fact that the pressure on learning the language is so huge, this subject have turned up earlier e.g. in the Korean omnibus film titled "If You Were Me" (2003). In the segment titled "Tongue Tie" (dir. Park Jin-pyo) parents of a young boy want him to be able to have a good command of English, and therefore decide he will be a subject of surgery of the language, in order to improve his pronunciation. Apart from this perspective, which is always worth reminding, "God Bless All Parents" portrays with high precision mechanism that rules the trade. The market machine, into which parents are drawn, do not have any sentiments. Proposed sets cost so much that it's hard to afford them, however when cunning sellers put at stake the future of the child, the decision is never easy. During frantic debates about the possible purchase, other issues also appear (e.g. dissatisfaction of the mother), allowing the director to present the complexity of the problem, while mocking this peculiar phenomenon. "Sew" (2011, dir. Li Yin-fung) to a certain extent is a surprising picture. It supposed to be a film about Man Lui - a teenager living with her grandmother - a gifted seamstress. Man Lui adores Japanese anime and shows her love by dressing up as favourite characters (the girl took a liking to Kagami Rei, character somewhat resembling Rei Ayanami from the anime "Neon Genesis Evangelion"). However the grandmother does not understand and does not approve the passion of granddaughter. After a stormy intergenerational conflict, each of them should realize their guilts and try to understand the other. In theory. In practice "Sew" is a film about a teenage girl who's grumpy all the time, does not understand and will never understand the way her grandmother's acting. In their conflict there's no room for shades of grey, everything must be white or black. The sole ray of light is the figure of grandmother, she is the only one undergoing transformation, in which the viewer is able to believe. The presentation of the environment of cosplay fans rather than refuting disapproving stereotypes, only strengthens them. Double shame, because the topic is worthy of attention and rarely raised. "Oasis" (2012, dir. Lam Sum) from the title is a shared flat to which Yu is going to move. She's a young girl who wants to become a painter, but currently, for a living, works as a model posing for graphic artists or bored businessmen pretending passion for art, and actually wanting for very little money look at the naked teens. She feels lonely, however with a time Fish, Zams, Kalok and the rest of her flatmates are becoming companions in her quest to creative rebellion and fight for the things really important. While the plot of Lam's movie lacks of added value, the director highlights some troubling issues. Once again returns the subject of space absorbed by the modernity. Young artists aren't rebelling only against unfavourable housing policy and functioning of the Department of Ground, responsible for permanent rent increases. The biggest problems is so-called "revitalization", in this particular case of warehouses located in the district of factories. Government plans to rebuild the district, replacing factories with shops and retail parks. Due to the fact that rent is much lower, the youth live in factories which government wants to liquidate. They are forced to act, and after every demonstration return to their own oasis, still safe, but for how long? Man Uen-ching work titled "Such a Girl Like Me" (2012) is based on short novel "A Women Like Me" (1982) written by Xi Xi (Cheung Yin). It is a story of a gifted makeup artist working not in a beauty salon but in a funeral house. She beautifies bodies of the deceased so that family and friends keep in mind their most beautiful image. Sum-yin is dedicating a lot of time to this job, but simultaneously is afraid to reveal to her boyfriend Kwon, where she really works. Due to circumstances the girl will have to make an ultimate choice. Although the story written by Xi Xi has just a few pages, it is rich in content. Man Uen-ching had a difficult task, with which he coped only partially. The main objection is not the atmosphere, that the director managed to recall to certain extent, but the length of the film. Fifteen minutes to take the topic has significantly distorted the original message. Anti-psychologism introduced to the film by author, suspends in a vacuum all actions of the protagonist. Resignation from even mentioning of the figure of Aunt Yifen (from which the girl had learned a lot) makes Sum-yin psychologically flat and to a certain degree unbelievable. The change of ending also raises doubts, however it's not possible to bear a grudge against the director for the sympathy for his heroine. This is probably why in the film the depressing sentence: "A woman like me is actually unsuitable for any man's love" never appears. "Flowers with Aphasia" (2012, dir. Li Sum-yuet) tell a moving story of a boy named Ho and seller of flowers named Dong. The first one visits many florists, where no seller treat him seriously. Finally he gets to a shop of Dong. Ho pays with his piggy bank, asking Dong to make a wreath and as the model gives seller a key ring with the head of bear (illusively similar to anime characters from "The Bears' School"). Over the next three days, while a wreath is being made, a certain bond appears between the boy and Mr Dong, thanks to which both will be able to help each other and understand irreversible. One could write very highly about "Flowers with Aphasia". The idea and narrative discipline should be appreciated. The subtlety and maturity of storytelling. Accurate selection of actors and a well-composed music. However, the greatest advantage of this picture is delving into the past. Li Sum-yuet, a young director, weaves in motives based on archaic beliefs, increasingly alien to the modern society. He also uses symbols, so that the structure of story becomes significant. The boy insists he wants to assist during the making of the wreath and select flowers by himself. Flowers, which don't smell, but "mean", silently passing all the unspoken words. Looking holistically at proposals from the Fresh Wave project, it seems refreshing that young authors are moving on so many thematic grounds. They are touching a wide range of phenomena and problems, and the majority of above voices is approaching issues in the critical way. 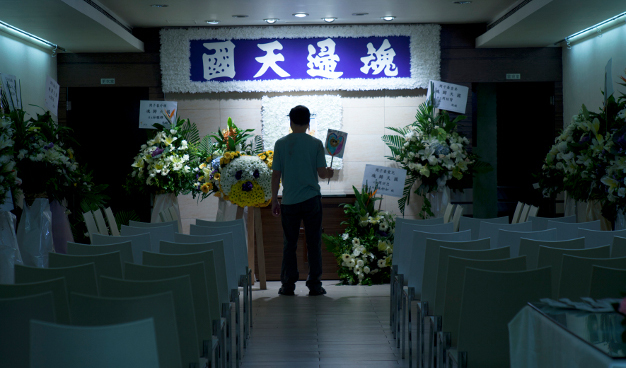 It is giving hope, regardless of the level of individual productions, that the younger generation of directors will be able to accurately and attractively describe Hong Kong reality, undergoing such an extraordinarily rapid transformations.